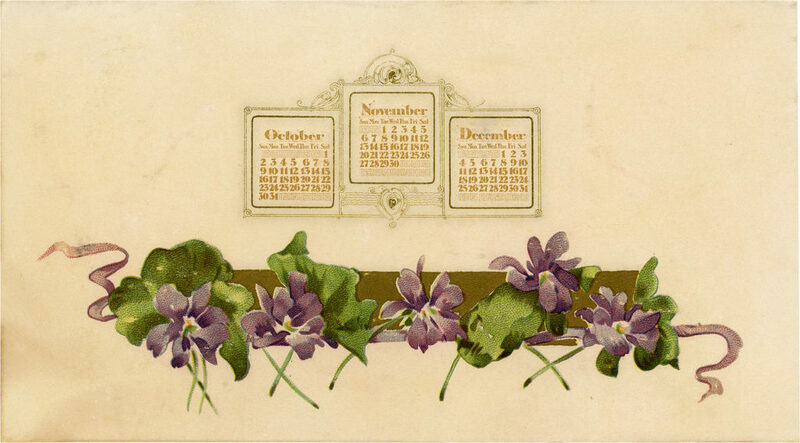 I have something very special for you today – 5 nostalgic images from an 1898 Printable Violets Calendar! WOW! It really brings back the look and feel of bygone days. 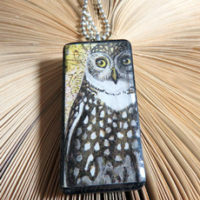 Originally, the five images were fastened together with a ribbon to hang on a wall. I think it would be awesome to replicate that with these vintage Violets Calendar images. There is a beautiful cover image with amazing typography in a golden heart. Each of the next four vintage images contains calendars for three months. They are decorated in the most beautiful way with flowers and ribbons. The colors and tones are just beautiful. The cream colored background cards are aged to perfection. 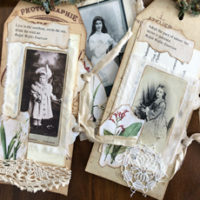 Together they form a lovely vintage calendar that would make an amazing theme for a junk journal or could be used to make greeting cards or a Spring Paper Craft Project! We begin with the lovely cover image of Nostalgic Violets on Open Gold Heart Graphic! 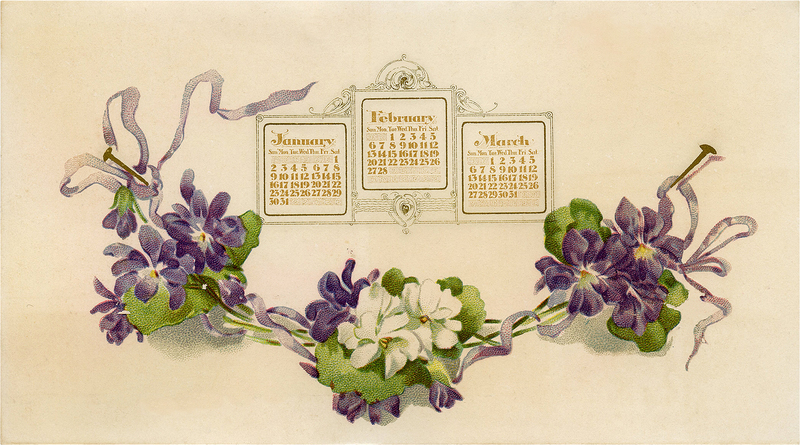 This calendar graphic from 1898 features a spray of violets around the edges of an open golden heart. 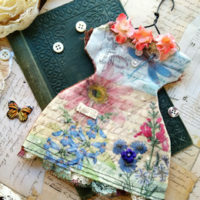 A light lavender bow and ribbons dance through the purple flowers and green leaves. 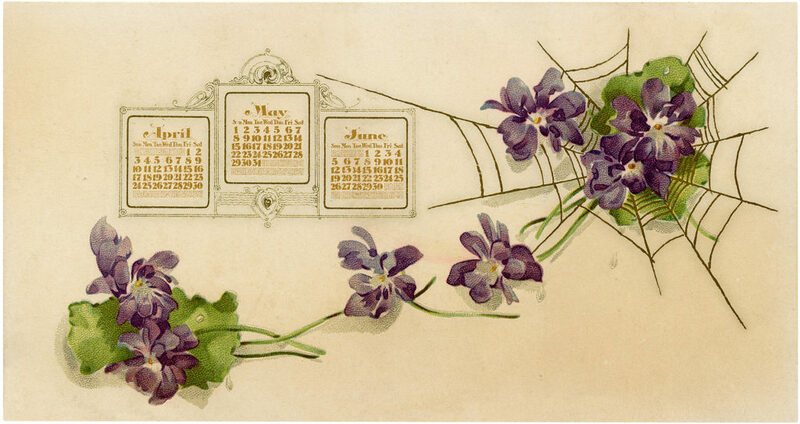 It reads, “Violets” A Calendar 1898 in beautiful script. This is the first one in this series I shared over a few weeks. This one was the top piece. 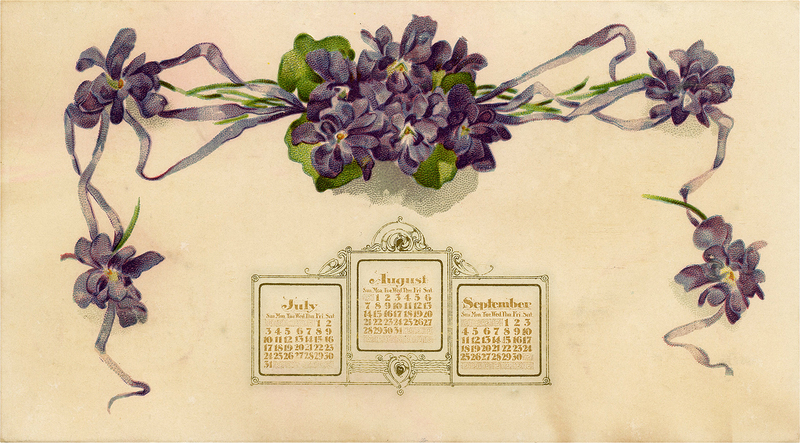 Above is a card of the first three months of 1898 in this Beautiful Antique Violets and Ribbons Calendar Graphic Printable! Three sweet sprays of purple and white violets wrap the bottom of this image. The three nosegays and light purple bows and ribbons flow throughout the half-moon arrangement. Above the flowers are January, February, and March calendars set in a scrollwork frame. The background is a delightful cream color aged beautifully. The next printable calendar image I am sharing is this fun Nostalgic Violets in a Spider Web Calendar Graphic! May, June, and July calendars rest on a scrollwork frame surrounded by lovely purple violets and green leaves with a magnificent black spider web on a beautifully aged cream background. Isn’t this a beautifully elegant Vintage Frame of our Violets Calendar printable? Purple violets and ribbons form a three-sided frame around calendars of July, August, and September on a scrollwork background. Takes you back to the Summer of 1898 doesn’t it? The final image of our 1898 Printable Violets Calendar is this Beautiful Nostalgic Violets and Ribbons Graphic! Five single purple violets with green leaves and stems rest on a brown rectangular backdrop with lavender ribbons flowing from each side. Above the violets are the October, November and December calendars. They sit in a beautiful scrollwork frame on the charming aged cream background. 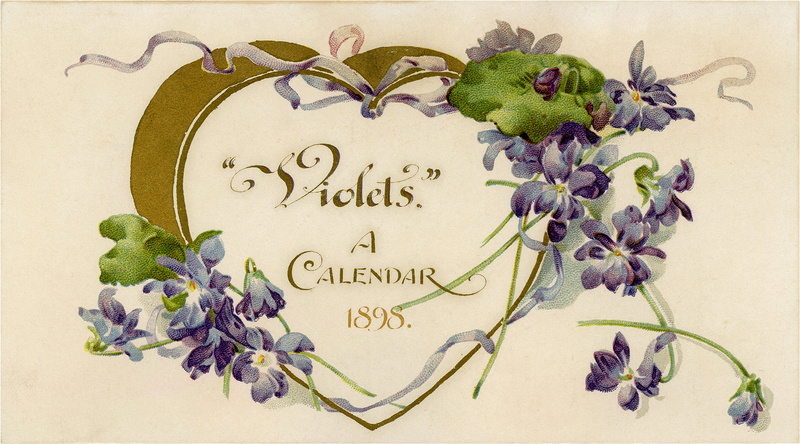 I hope you enjoyed this curated collection of vintage images from an 1898 Printable Violets Calendar. You might also like our Free Printable Vintage Style CD Case 2019 Calendar HERE! « 7 Bonne Annee French Images – Kids & Ladies! I can not print just the graphic selection of the violets you sent. It is embedded on a page with advertisements and more pages (as many as 11! ), starting from back to front. What a waste of paper and ink. Has something changed? I used to be able to print a full page for framing, which was so nice. What do you suggest to get just the graphic? That’s right–I had forgotten. But this time, all I could seem to get was three fourths of the image, missing the right-hand side. I tried different sizes but the same thing happened. I’ll keep trying. I love having different prints on display to change from time to time. Just stunning! One of my favourites! Thank you so much and enjoy your weekend!! Hi. I’m loving your freebies, but I can’t seem to figure out how to download using iPad. I’d like to do a course, but I haven’t signed up due to this. Help!